Love & Passion is one of Demircan’s original acrylic works on canvas. Fine Artist Esra Meral Demircan focuses on imagery that uses cultural objects in her perspectives with bold colours that stand out. Demircan produces work which concentrates on elements including romantic, sentimental and recognisable scenery. However, at the same time her work consists of bold and diverse contents. 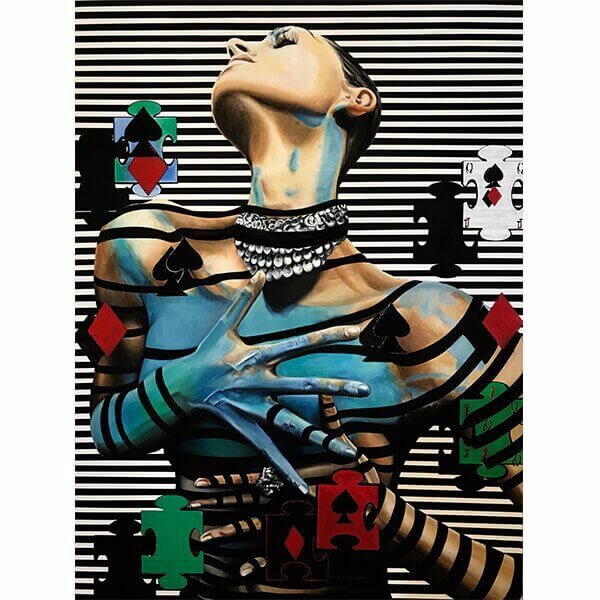 Her use of images from the modern world and her figurative compositions reflect the way she approaches life which is with passion and a touch of reality. Numerous works by contemporary artist Esra Meral Demircan are exhibited in private collections and the artist has participated in several exhibitions and art fairs both in Turkey and abroad. Having opened four solo exhibitions, she is currently working in İstanbul. Just some famous places showcasing her work include the National Academy of Arts, “21st Century 21 Artists Painting Exhibition”, Sofia IV, Turkish-Japan Contemporary Fine ARTS Young Artists and Teaching Staff Exhibition as well as illustrious exhibitions in her home Istanbul.